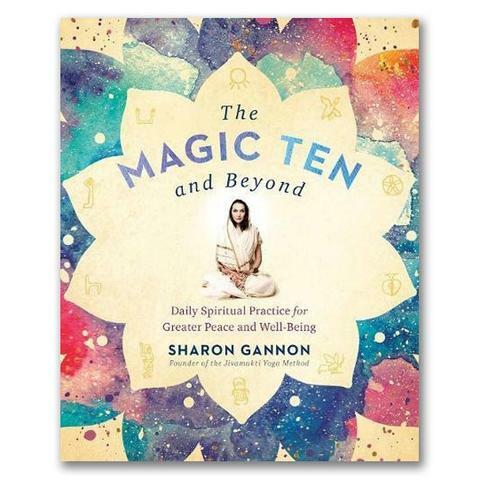 Adapted from The Magic Ten and Beyond by Sharon Gannon, copyright (c) 2018. Published by TarcherPerigee, a division of Penguin Random House, Inc.
YOGA IS A SANSKRIT WORD that means “to yoke or reconnect.” The goal of yoga is Yoga—to remember one’s connection to God—the Supreme Source, eternal happiness itself. Yoga teaches that within each living being there is an eternal soul, the atman. The practices enable us to reconnect to the atman and to understand that our mortal bodies are dwelling places for our immortal soul. The practices alchemically transform our perception of who we are. The body of the enlightened yogi houses the light of truth. The yogi lives in the world as an instrument for this truth. There are many yoga practices that can guide a person along the way to that magical remembering of who he or she really is. Some of those practices are explored in this book. There are accounts in the various yogic scriptures and holy books that describe the path, or way, of yoga. We can read about the lives of yogis from ancient times and get a glimpse into their world and into how they walked their paths. In this book I share some of the practices that have helped me along my way. I also share some of my ideas regarding the history of yoga and my speculations regarding its possible connection with ancient Egypt. I love India and have great respect for the spiritual wisdom of her culture, and yet I can’t deny that I am attracted to the mysteries of ancient Egypt and feel that yoga may be more universal than is usually thought and could have been shared by both cultures. Ten years ago this intuition led me to visit Egypt. While in the Great Pyramid, lying in the King’s Chamber, I had an out-of-body experience. A day later at the Egyptian Museum in Cairo I saw a painting of a figure that looked as if she were doing an asana, and met an Egyptologist who showed me a magic circle, called a cartouche, containing ten hieroglyphs that looked to me like they could be describing yoga practices—remarkably, the ten practices I did every morning. This is why every chapter begins with an image of an Egyptian hieroglyph followed by a poetic account as to how the meaning of the hieroglyph might translate into the yoga practice described. The Sanskrit word sadhana means “conscious spiritual practice.” What distinguishes a yoga practice from a physical fitness exercise routine is intention. When you engage in an activity with the conscious intention for it to bring you closer to enlightenment—then it is sadhana. Sadhana is never something you do for yourself. It is always about getting over yourself, your separate ego self, and awakening to how you are part of a higher Divine Self. Without the essential ingredient of bhakti, which means “devotion or love for God,” sadhana will not yield anything interesting or magical but instead will keep one ego-centered and bound in mundane reality and the pursuit of temporary happiness through material accumulation. With yoga centers in just about every city, town, and village in the world today, a person has many opportunities to take yoga classes and to study with qualified teachers. I am not advocating for rejecting the yoga studio model, but we should nonetheless remember that yoga is about reconnecting to God, which is ultimately a solitary journey inward. As yogis we should develop independence—dependence inward. The journey within is the journey toward lasting happiness. To be able to go to a class with others is great, and it has many benefits. But sometimes, whether because of schedule demands or financial limitations, attending a yoga class may not be possible. That shouldn’t mean that you can’t practice yoga. You should have something easy and doable that you can access any time, so that you are not dependent on going to a class to practice yoga, and yoga can become a way of everyday life. The Magic Ten and Beyond describes my personal practice—what I have done over the years in the privacy of my home or in a hotel room or wherever I happen to be. There are practices for how to wake up in a good mood every morning and for how to become more saintly; practices that reveal the secrets to wealth and abundance and that will increase your vital energy. There are practices that will help you resolve old relationship issues by detoxifying your body and purging your thoughts of negative emotions, and that will keep you limber and fit well into old age. There is an easy step-by-step meditation practice as well as a way to free yourself from the fear of death and live at ease comfortably in your own skin for the rest of your life. Sharon is the founder of the Jivamukti Yoga School and Jivamukti Method, created with David Life in New York City in 1984. Since, Jivamukti Yoga studios have opened all over the world, including in London, Moscow, Munich, Berlin and Sydney. Sharon is an artist, animal rights advocate, musician and a best-selling author of many acclaimed publications with the release of The Magic Ten and Beyond.